Cracked soil puckers around the edges of hot, shallow pools. Dead carp and buffalo fish lie strewn across the river channel. Some are picked apart by birds, some are dragged away by coyotes, others just decompose. And each day, as the dry New Mexico wind shaves away at the pools, the smell of rotting fish grows stronger. 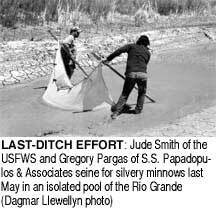 It doesn't sound like ideal habitat for the Rio Grande's endangered silvery minnow, but it'll have to do for now. Since early June, U.S. Fish and Wildlife Service employees have been working on the "Rio Grande highway" near Socorro, N.M., a seven-mile stretch of dried-up river. Salvage crews net minnows from the isolated pools, truck them upstream, then release survivors into the Rio Grande at Albuquerque. There is irony in their toil: Only 100 yards away, water for downstream irrigators flows out of the river through a conveyance channel. It wasn't supposed to happen this way. Two years ago, federal agencies and the state agreed to establish a "conservation pool." For three years, 30,000 acre feet of water a year - enough for 186,000 Albuquerque residents - would be set aside in an upstream reservoir and released in dry times for the minnow. In an agreement made last year, the Fish and Wildlife Service required that the Bureau of Reclamation keep a minimum amount of water flowing through the minnow's habitat. Those agreements haven't proven effective in a severe drought year. Local environmental groups, dissatisfied with the enforcement of the new regulations, filed a lawsuit against the responsible federal agencies. In April, in a 50-page favorable decision, Chief U.S. District Judge James A. Parker not only upheld the requirements issued by the Fish and Wildlife Service, but also said the Bureau does, in fact, have "discretion" over both the Rio Grande's "native" water and water diverted into the river from the San Juan and Chama rivers. The state, the city of Albuquerque, farmers and even the Bureau itself continue to claim that the federal government does not control those waters. The decision, which is being appealed, means the Bureau must supply water to the minnow under the Endangered Species Act, even if that means limiting the supply of water to irrigators. Nonetheless, according to U.S. Geological Survey data posted on the Internet, flows in the middle Rio Grande south of Albuquerque - critical habitat for the minnow - regularly did not meet the Service's 50 cubic feet per second (cfs) target flows in May and June. While farmers continued to receive their full water deliveries, recorded flows in June were consistently less than half the required minimum, and even dipped as low as 14 cfs. When questioned, officials at both the U.S. Fish and Wildlife Service and the Bureau of Reclamation claimed that an out-of-whack gauge was responsible for the low numbers. Then, when a seven-mile stretch of the river dried up in early June, they pointed to the drought. 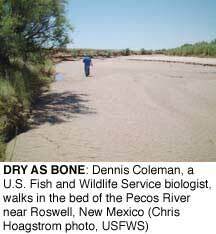 But even a passing glance at New Mexico's rivers shows that in a drought year, fish don't get water, agreements or not. This year, not only did the Bureau violate the minimum flow requirements, it didn't have enough water left in the conservation pool to keep the river from drying. In June, after the river had already dried near Socorro, the City of Albuquerque leased the agency 30,000 acre-feet of water, which it plans to send downstream to the minnow. It's a temporary fix that conservationists say won't help the minnow in the long run. "Because it's so dry, it's even questionable that if the water were released (from upstream reservoirs) it could make it the 100 to 200 miles downstream," says Kara Gillon, a wildlife lawyer for Defenders of Wildlife. The Santa Fe-based Forest Guardians, which has filed suit in the past against federal agencies for mismanagement of New Mexico's rivers, is planning to take legal action again if the Bureau doesn't keep the Rio Grande flowing. But for now, the group is focusing on a more critical problem. "The biggest issue right now is the Pecos River, because the ecological realities are much grimmer at the current moment," says executive director John Horning, "In the Pecos River, the Bureau operates the system like it's a private plumbing system for irrigators." Once infamous among cowboys and homesteaders for slinging silty, unpredictable torrents down eastern New Mexico and on into Texas, the Pecos River dried up for about a 40-mile stretch this spring. Part of this reach is habitat for the Pecos bluntnose shiner, a species listed by the U.S. Fish and Wildlife Service as threatened since 1987. Though shiners once swam throughout both the Rio Grande and the Pecos River, the Rio Grande variety went extinct in the mid-1960s. Now the species is found only in patches of a 200-mile stretch of the Pecos River between Fort Sumner and Brantley Reservoir north of Carlsbad. Formal efforts to protect the Pecos bluntnose shiner's habitat trace back to 1991 when the Bureau, the Fish and Wildlife Service, and the Carlsbad Irrigation District signed a five-year agreement to study the effects of the Bureau's upstream dam operations on the shiner. The wet years of the 1990s fostered cooperation among the federal agencies and farmers, and led to a resurgence in the shiner's population. According to fish biologists, in the early 1990s shiners were rarely seen in the river. By the end of the 1990s, after the river had stayed wet for 10 consecutive years, they were one of the three most common species. By 1998, two more players joined the negotiations: the New Mexico Interstate Stream Commission, the agency that delivers water to Texas, and the State Engineer's Office, which oversees the water rights of New Mexico's irrigators. During this time, the Fish and Wildlife Service recommended a 35 cfs minimum flow which the Bureau was responsible for maintaining. It followed up last year with a recommendation for the creation of a 10,000 acre-foot conservation pool in one of the upstream reservoirs on the Pecos. But, as drought regripped the region in the late 1990s, cooperation among the federal and state agencies fell apart. When the time came to follow the flow recommendations in a dry year, the Interstate Stream Commission clashed with the Fish and Wildlife Service, claiming that studies which shaped the flow and conservation pool recommendations were flawed. "The research was not considered scientifically sound," says Rebecca King of New Mexico's Interstate Stream Commission. Now, the state has hired consultants to complete its own study of the effects of river drying on the fish. Scientists are trying to determine if the shiner, which evolved in a desert ecosystem, can survive one or more years of river drying. The study delays any new attempts to find water for the fish and has frustrated biologists with the Fish and Wildlife Service. "If all the agencies had cooperated to put a conservation pool in, we'd have something to work with now," says Jim Brooks, the project leader at the Fish and Wildlife Service's New Mexico Fishery Resources Office. "All the state and their consultants are trying to do is prove fish don't need water." Unless the monsoons kick in soon, this will be a good year to test that hypothesis. Laura Paskus is an HCN intern. U.S. Geological Survey Real Time Water Data on the Web: water.usgs.gov/realtime.html.